Hoping to have someone come by and see if there are potential cracks in my foundation. Had water leaking in this winter thaw and want to understand the best action. I have a crack in the wall in our basement that is causing water to come in every time it rains. Looking to have the crack repaired. Looking for a new sump pump system with backup. Require basement waterproofing. Would like to explore interior vs exterior options. Ready to hire after quote and understanding the best option for the situation. Seepage in basement wall adjacent to driveway. I am planning to renovate the basement. I removed the subfloor, tiles, some non-bearing walls, and I would like to find the best way of leveling the concrete slab. It appears that it's lower in the center of the rooms. I am looking for the best method for leveling the floor, before I do any other work. I have water entering my basement always at the mid or end of winter. Water comes in between the homes. Can we get a price to have this repaired. From one business owner to another, I would like to congratulate you on your staff and projection of professionalism! I thought you did a fabulous job. I was so happy. I called, the salesman came right away. I said how long will it take to do it. Well, he said he could do the job next week and you did the job next week! Everybody who showed up was lovely to work with. They did exactly they were supposed to. My favorite of everything was that there was no mess! Elizabeth from Toronto called on Clarke Basement Systems for help with her wet basement. We had a great experience with Clarke Basement Systems. They were extremely knowledgeable. They were really professional. I loved their confidence. I'd ask them questions like ' if we ever have water down the road..' and their answer would be: 'You're not going to have water down the road'. And I just loved that there was never any sense of doubt. They knew their system worked. We would like to let you know that your company present high standard of business practices. From receptionist to professional visiting (Ron Monk in our case). All are helpful ,friendly and with an extra human touch which we really appreciated. The work done has accomplished everything I hoped for. "Ali - Fereid performed the maintenance on our sump pump. He..."
Basement flooding is a major problem in Toronto, ON. Since the city’s sewer system isn’t designed to handle heavy rainfall over a short amount of time, surface flooding and basement flooding are all too common. In preparation for the area’s frequently severe weather, it’s important that Toronto homeowners take action to reduce the risk of basement flooding in their homes. If you have cracks in your foundation or basement walls, a faulty drainage system, or leaky basement windows, it’s likely that your basement will suffer from water damage. That’s where we come in! Clarke Basement Systems is a locally owned and operated basement waterproofing company that has been serving the Toronto, ON area for over a decade with high-quality products and trusted service. We specialize in waterproofing basements and crawl spaces, repairing foundations, lifting sinking concrete, concrete crack repair, and concrete sealing in Toronto, ON. Our warrantied solutions are proven to last for the long-term, and we have access to the best basement waterproofing and foundation repair products in the industry. If you need basement waterproofing, crawl space encapsulation, foundation repair, or concrete repair, contact us today to let our experts evaluate your home and provide a free estimate for the work you need! We proudly serve Toronto, ON, and areas nearby. Whether your basement floods every time it rains or you have a small basement leak, a wet basement can mean expensive damage and mould problems. If you have a basement water problem, no matter how big or small, Clarke Basement Systems can prevent flooding and leaks with our proven basement waterproofing system. From our patented WaterGuard drainage system and powerful sump pumps to our energy-efficient dehumidifiers, we offer the high-quality products and professional installation you need to keep your basement dry all the time! A crawl space in Toronto sealed with our CleanSpace crawl space encapsulation system. We are also experienced in dealing with water damage and mould problems in crawl spaces. Our CleanSpace crawl space encapsulation system seals your crawl space to keep out moisture and pests and prevent mould and rotting, making your entire home healthier and more comfortable while reducing energy costs. We also offer sump pumps and dehumidifiers specifically designed for crawl spaces that will keep the area moisture-controlled and watertight. If you already have a mould problem in your crawl space, it’s important to act fast to keep the mould spores from spreading throughout your entire home. Mould can be a persistent problem that’s difficult to permanently remove, and can cause health issues such as increased allergy and asthma symptoms. Clarke Basement Systems provides wood damage repair, dry rot damage repair, mould prevention, and more to keep you and your family safe and comfortable with better indoor air quality. Foundation problems are common in Toronto because of the frequent occurrence of basement flooding, which can cause foundations to crack. Even if you’ve never had water in your basement, you can still have foundation issues due to poor compaction, plumbing leaks, or expansive soils which tend to shift when there are changes in soil moisture. When the soil beneath your foundation expands or contracts, foundation settlement and sinking can occur as the soil layers become less stable. 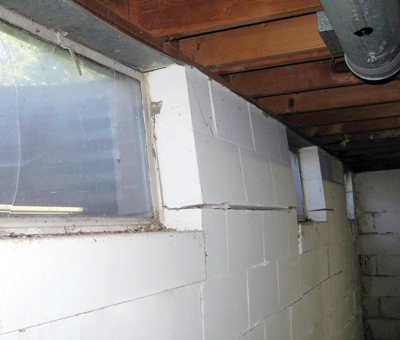 Bowing, cracked basement walls are a common sign of a foundation problem. If you think you might have a foundation problem, we have the solutions and experience to effectively repair and stabilize your home. Our patented foundation pier systems can solve many foundation problems such as bowing walls, sagging crawl space, and foundation heave. We value the safety and satisfaction of our customers above all else, and our qualified foundation contractors will design a custom solution to solve your home’s specific needs! Do you have a walkway outside your home that looks like this? We can raise it with PolyLevel! If you have a cracked or sinking concrete driveway, sidewalk, patio, steps, or interior slab, our concrete leveling, concrete crack repair, and concrete sealing solutions can help. With the state-of-the-art PolyLevel concrete lifting system from Clarke Basement Systems, we use an expanding foam which is injected under the damaged concrete to lift and stabilize the slab. PolyLevel is a faster, stronger, more affordable, and less invasive alternative to traditional mud jacking and concrete replacement. We also use NexusPro to repair concrete cracks and joints. This long-lasting concrete crack repairing sealant can withstand UV rays, extreme weather patterns, fluctuating temperatures, and more to provide a durable solution. Whether you've just finished your concrete repair project or you have just installed new concrete structures, our tough concrete sealant, SealantPro can extend the life of your slabs by 3 to 5 times overall. In just one application SealantPro effectively guards against oil, gasoline, liquids, and other debris! If you need basement waterproofing, crawl space repair, foundation repair, or concrete repair services for your Toronto home, call the local experts at Clarke Basement Systems today. We offer free, no-obligation consultations and cost estimates in Toronto, ON, and throughout surrounding areas! Connecting the WaterGuard® system to the new sump pump. DryTrak® Drainage System lays flush against the foundation, collecting any excess mositure. Diana T. put a new addition onto her house and began to question whether the existing waterproofing systems in place would truly protect her home in the event of a primary pump failure or a power outage. To ease her mind, she contacted Clarke Basement Systems for our waterproofing expertise. Upon inspection, it was clear that some of the existing systems needed to be updated to provide the best protection against unwanted water. Some of the additional basement systems implemented included our patented SuperSump® Premier Sump Pump System, UltraSump® Battery Back-Up System and IceGuard® Discharge Line System. These systems worked together to effectively pump out unwanted water without allowing it to evaporate into the basement which could cause mould as well as provide assurance in the event of a pump failure or power outage. Diana can now rest easy knowing that her basement is now wholly protected against potential unwanted water. Clarke Basement Systems is pleased to have been able to assist this Toronto, ON homeowner with ALL of her waterproofing needs. Ross and Rhonda W. realized that groundwater was seeping through the foundation wall in their basement. This was affecting their finished basement and caused worry about mould and health concerns. These new homeowners contacted Clarke Basement Systems for the best solution for their wet basement. The solution provided included using our patented WaterGuard® Below-Floor Drain, ThermalDry® Wall System, SuperSump® Premier Sump Pump System, UltraSump® Battery Back-Up System and the AprilAire Model 1850 Dehumidifier. These basement systems worked together to ensure that any unwanted water entering the basement is directed into the drainage system and then away from the house while controlling the level of humidity. The UltraSump® Battery Back-Up System provides an extra layer of protection in the event of a power outage. Thanks to the reassurance and reliability of these great basement systems working together, this basement is now dry and healthy. Ross and Rhonda W. no longer have to worry about unwanted water or health concerns from a wet basement. Clarke Basement Systems is pleased to have been able to assist these Toronto, ON homeowners with transforming their basement and quality of life. Frank R. was looking to refinish his basement; however, he knew that he had to deal with the water seepage and mould damage that was the result of groundwater entering his from various entry points, before making any further steps. Clarke Basement Systems had the perfect solution for this wet basement problem. The solution included our patented WaterGuard® sub-floor perimeter drainage system, WaterGuard® port, ThermalDry® Wall System, SuperSump® Premier Sump System, IceGuard® Discharge Line System, SunHouse™ Enclosure and WellDuct® Basement Window Well Drain. These systems worked together to capture water and drain it into the Sump system, while still protecting the walls, reducing humidity, preventing heat loss as well as preventing ice damage and brightening the basement space. This Toronto, ON homeowner, can now proceed with refinishing his basement without a second thought. Clarke Basement Systems is pleased to have been able to assist Frank R. with getting a few steps closer to the basement of his dreams. The crawlspace below Mike S’s new home was notorious for letting mice in and allowing warm air to escape. Wanting to rid himself of having to clean up waste left by mice and in an attempt to save the extra money spent on attempting to warm the house, Mike contacted Clarke Basement Systems for a permanent solution. The solution for this creepy crawlspace included our patented CleanSpace® Basement Wall Vapor Barrier, ThermalDry® Wall Insulation, drainage matting and wire mesh. These systems worked together to encapsulate the crawl space, deter rodents from entering, and preserve heat within the household. Mike S. can now enjoy his warm, rodent-free home without a worry in the world about his crawlspace. Clarke Basement Systems is pleased to have been able to assist this Toronto, ON homeowner with ALL of his crawlspace needs. Water penetration will cause significant damage to your home. If left untreated, water will damage your personal items and basement materials. Our team at Clarke Basement Systems will provide a long-lasting permanent waterproofing solution to your water penetration issues. Sadly, our customer in Toronto, Ontario, refused to use their basement because of water seepage. They needed our help! Our customer is thankful to have their basement waterproofed with our 25-year warranty, thanks to Claude Mathieu, Jose, and his crew. They now have peace of mind knowing there is no more water penetration. Our customer in Toronto, Ontario, contacted our company regarding an issue with both the interior and exterior of their home. The grading of an area outside of their home was causing water to flow towards the foundation and underneath a door, resulting in damage to both the drywall and personal belongings. The build-up of water was creating hydrostatic pressure as it was trying to force its way through the foundation. WaterGuard® and ThermalDry® Membrane work together to eliminate goundwater trying to seep into the home by directing it into the SuperSump® System. An Exterior TrenchDrain™ was installed to collect the surface water as it flowed towards the foundation. These systems connect to a buried discharge line that directed the water away from the foundation of the home. Our customer was pleased with the job done. The hydrostatic pressure has been eliminated and the basement is now dry, as there is no more water entering the home. When most people think about basements they picture a cold, damp and dark area but it should be a warm, useful, family space not a dungeon. Our customer in Toronto, Ontario, was not comfortable in their basement they refused to use it. The high moisture levels in the air made the concrete floors damp and cold. The basement is now a warm and useful space for the family to use. Our customer is thrilled and relieved to have a comfortable basement thanks to Clarke Basement Systems! If left untreated groundwater seepage will damage a basement, ruining personal items and finishing. Over the past couple of years, a leak in our customer’s home in Toronto, Ontario, had become much worse. It became concerning after discovering traces of mold under the soiled carpet. The basement became unusable, and they wanted a permanent solution. Our customer is relieved to know that they can now use their basement and refinish it without worrying about water leaking in. A customer in Toronto, Ontario, called us because they didn’t like the appearance of their custom basement window well. The plastic cover didn’t fit well and was breaking because it wasn’t meant for this type of well. They wanted something that was nice to look at and would get the job done. Our customer was pleased that the new window had a more appealing look and received excellent customer service and information given by the team. A resident of Toronto, Ontario had a concern located in the basement of their home. The customer stated they could hear water dripping into the sewage ejector during light/heavy rain storms. This was a concern because it meant that water from the ground was continuously gathering under the concrete foundation. When our team inspected the area, they found more problems. After pulling back some drywall, they found that the foundation blocks were damp and dark from where moisture was building up and could have caused further damage to the home due to mold in the drywall, wood framing, etc. Claude Mathieu, System Design Specialist, and Luke, Ben, Kenny, Josh, and Matt all worked together to complete this project. Claude advised the customer of all the issues in the home and set up a system that would permanently fix their water issues. A DryTrak®, WaterGuard®, WellDuct Window Drain, ThermalDry® Wall Membrane, and a TripleSafe® Sump System were installed to waterproof the customer’s basement. These systems all work together to capture the moisture underneath the floor as well as through the walls and window wells. To eliminate water levels and keep the heat in, a ThermalDry® Floor Matting System and a ThermalDry® Floor Decking System were also installed. The customers were very pleased with the solution to their problems and the way the team executed these procedures. They are now able to use their basement space with their entire family. A homeowner in Toronto, ON had too much water flooding their lawn and walkway from the sump pump discharge and downspouts. This area was so saturated, the homeowner and his family could not use this part of the yard. It was a frustrating situation. The family loved to spend time in this area in the summer. Claude Mathieu, Senior System Design Specialist, visited the homeowner and discussed ways to solve this problem. To get the water under control, Don Clarke, Project Foreman, and production crew installed a TripleSafe® Sump System, buried discharge line, Heat Line and Drywell. The system works together to send water below grade to the Drywell. It helps eliminate surface flooding. The TripleSafe sump system maintains pumping capacity when needed. Now on clear, sunny days, there’s nothing better for the family than enjoying their well-drained yard in the summertime or any time during the year. A homeowner in Toronto, ON had a room in the basement that had groundwater seepage through the walls and up from the floor. The floor was a mix of broken concrete and brick with a wood sub-floor covering it. The water was causing mold to grow on the drywall and the sub-floor was rotting making the basement smell musty to the point where they couldn’t use the basement. The homeowner was afraid the groundwater would find its way into the rest of the finished basement and cause even more damage. Once the customer booked an appointment, Ron Monk did an inspection of the basement to see exactly what was happening. After discussing options with the homeowner, Ron designed a solution that would work well in this situation. Lucio Flores, Installation Foreman, put the plan in motion. The wood sub-floor and concrete floor was removed. The ThermalDry Wall® System was installed on the basement walls with mechanical fasteners so it will never come off. ThermalDry protects the finished walls installed in front of it and acts as a radiant barrier preventing heat loss into the cold mass of the concrete walls. WaterGuard® was carefully set in place around the full perimeter of the room and a drainage bed was created with clear stone. WaterGuard is designed to capture water at the footing wall joint and drain the water to the sump system. The basement floor was then restored over the drainage bed. SuperSump® and UltraSump® systems were installed and connected to the WaterGuard® to pump water outside through the IceGuard® discharge line. The 2-pump combination of a SuperSump and UltraSump protects against primary pump failure and power loss to the house. The homeowner was very pleased with the project. They were able to refinish the room with the confidence that it was going to stay dry and stay dry all the time without fear of mold growing and affecting their family’s health. They were happy that we were able to gain extra headroom. The homeowner was also very confident with Clarke Basement Systems’ warranty against groundwater seepage and that it is nationally backed through the Basement Systems dealer network, transferrable if the home is ever sold. A home in Toronto, ON, had a problem with its finished basement. Water was seeping into the finished basement and was ruining everything! The finished walls and floors were getting destroyed by the ground water seepage. As the water levels grew higher, more and more of the customer’s belongings were getting ruined. The basement, over time, had become an unhealthy and unusable space. The customer called Clarke Basement Systems and arranged to have a waterproofing specialist examine their home. Shortly after, Claude Mathieu came to their home and assessed the situation. Claude found the parts of the basement that were leaking water and put a plan together to stop the ground water seepage. Our foreman, Dave Jackson, and his crew installed ThermalDry Wall to collect all the water seepage and any water that was evaporating through the foundation walls. He then installed WaterGuard® so that all the trapped water would funnel into it and be drained towards our SmartSump™ system. TrenchDrain was used to capture any surface water that may leak through the walkout door too! Our customer was ecstatic! They now had their basement back and knew that it would never flood again. A home in Toronto, Ontario, had water seeping into the basement over a long period of time. It was casing damage to the floors, walls and any personal item the homeowner had. The homeowner wanted a solution so they could be able to use the space not have to worry about smell. The customer called Clarke Basement systems and Claude Mathieus explained the solution to the problem. Lucio and the team came in and installed ThermalDry Wall to capture any moisture or water that may seep through and direct it into the installed WaterGuard. It is then pushed into the installed SuperSump to avoid flooding and push out and away from the home. This waterproofing system was used around the entire basement perimeter to ensure there is no more water leakage. The customer is very satisfied with the work done to the home because they can now refinish basement and use the space with no concerns of ground water leaking in. A home in Toronto, Ontario was experiencing basement flooding. One window that was located close to a down spout was not draining away the water fast enough. Every time it rained, they had to spend time mopping up the water to prevent the flooding from ruining more of the basement carpet and baseboard. There had been over 1 foot of water in the window well. The customer called Clarke Basement Systems and spoke to Claude, who explained the solution to their problem. Don Clarke and the team came in and were able to excavate in order to create new positive drainage. As well, the view from the room will be much more inviting now as with the new Sun House Window Well enclosure allows much more sunlight in, and none of the leaves and debris that partially caused the drainage to fail would cause the basement to flood again. The homeowner was extremely happy knowing they wouldn't have to waste any more time cleaning up water leakage every time it rained. A car repair shop in Toronto, Ontario, has many cars coming in and out. In the winter, the cars come in to be worked on and the snow and slush melts of onto the garage floor causing a lot of ground water that had to be squeegeed to one small drain. The business owner realized this was taking time, when they could be working on paying customer's cars. The owner called Clarke Basement Systems and spoke to Claude Mathieu, who explained the benefits and process to our solution. Don Clarke and the team came in and installed Interior TrenchDrain, Exterior steel TrenchDrain and a SuperSump sump pump system. The TrenchDrain captures the melting snow and slush and drains it to the SuperSump. The Tenchdrain was installed in the floor, in areas that the snow and slush would melt off the cars allowing the water to drain and direct to the Sump Pump instead of pool on the surface. The owner and employees no longer waste valuable time dealing with the problem. A home in Toronto, Ontario, had a problem in the basement. The homeowner wanted to remodel the basement but had groundwater seepage. They couldn’t refinish the basement unless the groundwater was controlled otherwise it would damage the new building materials they had planned to install such as drywall and flooring. The customer called Clarke Basement Systems and spoke to Ron Monk, who explained the process of the solution. Jose Martinez and the team installed Waterguard sub-floor around the perimeter of the basement with Waterguard ports. They also installed Thermaldry wall system, Triplesafe sump system, Iceguard discharge and a Lawnscape Outlet. Waterguard is designed to capture water at the footing wall joint and drain the water to the Triplesafe sump system and keep the basement dry all the time. The Thermaldry walls helps to reduce relative humidity and ensure wall leaks are drained to the Waterguard installed in the floor. ThermalDry also protects the finished walls installed in front of it and acts as a radiant barrier preventing heat loss into the cold mass of the concrete walls. The Triplesafe sump system is a 3 pump system with redundancy built in to protect against primary pump failure, large volumes of water and power loss to the home. It will ensure the basement stays dry all the time. It is installed with the Iceguard fitting that protects the system if the discharge line becomes blocked or frozen. The Lawnscape outlet is used at the end of the buried discharge where water discharge onto the surface of the ground away from the home. The customer was satisfied because they were able to refinish the basement with the confidence that the whole basement was going to stay dry all the time without the fear of mold growing and affecting the family’s health. The homeowner was thrilled with Basement Systems 25 year dry basement warranty against groundwater seepage and was satisfied that it is nationally backed through the Basement Systems dealer network, transferable if the home is ever sold. A home in Toronto, Ontario had a problem located at the side of the home along the concrete walkway. The concrete walkway was sinking in various places along the home with the vast majority of the slabs sinking towards the foundation. The soils around foundations are usually very loose, as they are not properly compacted after the home is built. 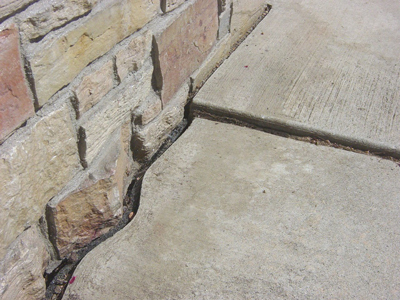 The weight of concrete tends to further compress these soils, leading to sinking and cracked walkways. The sinking concrete was causing trip hazards along the walkway and water was also pooling around the foundation. If water continued to flow towards the foundation, it could lead to future basement and foundation problems. The trip hazards also posed a serious safety risk. The customer called Canadian Concrete Leveleing and John DiNicolantonio explained everything that would be done to help fix the problem. Kyle McKeown and the team came in and used the PolyLevel Foam System and NexusPro Joint Sealant. Our PolyLevel Foam System is injected beneath the concrete to lift and level the slabs. Our expanding foam is compress the substrate and lift the concrete to ensure the area is protected from further settlement. The NexusPro Joint Sealant is then used to seal the gaps between the slabs and the foundation to prevent water from damaging the foundation. We drilled small dime sized holes through the concrete and injected our PolyLevel Foam underneath the slabs. The foam followed the path of least resistance underneath the concrete to fill all of the voids and then expanded. We were able to use the expansion of the foam to lift the walkway to protect from further settlement. The customer was always wary of a basement leak because of the water pooling along the house and was extremely happy that we were able to achieve a positive slope away from the home and remove the trip hazards in the walkway. A home in Toronto, Ontario had an issue with the basement window. The homeowner requested an egress window to be installed in the basement because the basement didn’t have a second exit in the event of and emergency. Without a second exit people may be trapped in the basement in the event of a fire. The customer called Clarke Basement System and spoke to Ron Monk, who explained everything that would be done. Don Clarke and the team came in and installed a Custom Window Well. The galvanized well was replaced with a custom built window well, using treated lumber with a steel grate as a cover. The original window was replaced with a larger window to meet egress code requirements. The customer was satisfied because it made the basement safer as it allowed for a second exit from the home in the event the primary exit was blocked for any reason. As a bonus, it also created more light into the basement. A home in Toronto, Ontario had a basement that was very damp and leaked in several locations when it rained. The basement was approximately 700 sq. feet and they would see water coming up through the ceramic tile joints. The issue was hydrostatic water pressure from below the house, as well as moisture penetration through the foundation walls, due to failure of proper external waterproofing system when the home was built. The basement was a finished and they wanted to have a finished basement space with no water leaking in causing mold and damage. After having their personal items and the finished walls and flooring damaged they decided to call Clarke Basement Systems. Jose Martinez and the team installed a WaterGuard internal sub floor system was to capture ground water. A ThermalDry Wall membrane was used to direct moisture from foundation walls to the WaterGuard. A SuperSump sump pump with UltraSump Battery Back-up in case of power failure was installed to collect water and discharge it outside through our IceGuard. This system ensures that any ground water penetrating basement is captured and pumped away from foundation. These products were used around the full perimeter of basement to ensure no more leaks. Now the home owners can finish and use the basement. A home in Toronto, Ontario had a settling problem located in the basement along the back wall and corner of the home. If the foundation continued to settle it would cause damage to the upper floors of the home and could become structurally unstable.The homeowner noticed a step cracking in the block foundation wall which was the result of the foundation settling. The foundation could become unstable which would damage the upper floor finishing and also could adversely affect the value of the home should they decided to sell. The customer needed Foundation Supportworks to come in and fix the problem. Shane O’Rourke and his team came in and used Push Pier Vertical Assembly. The push piers are used to stabilize the foundation. The Foundation SupportWorks push pier assembly is installed with a heavy bracket connected at the bottom of the foundation. The pier is pushed into the ground until the equipment measure that it has hit solid bedrock. At that time the homes weight is transferred to the pier and off the failing soils. The customer was satisfied because the home was stabilized and further damage to the home was prevented. A home in Toronto, Ontario, had groundwater seepage located in the lower portion of a side split basement. The water was coming through cracks in the foundation wall. The basement was finished and there was damage to the walls and flooring. The concern was also there may be mold. It was affecting the homeowner because they lost living space and with a small child they were concerned about the health effects. The customer called Clarke Basement Systems and spoke to Ron Monk who explained exactly what would need to be done to waterproof the home. Jose Martinez and the team came in and installed a Waterguard, Waterguard port, Wellduct, Buried Discharge, Iceguard, Triplesafe with an Ultrasump and ThermalDry Wall Membrane. The Waterguard was installed around the full perimeter of the exterior walls to capture water and ensure the whole basement stays dry. Water is directed to the Triplesafe Sump System to ensure it is ejected from the home and the basement stays dry all the time. Waterguard ports allow for inspection and service of the system if necessary. The Thermaldry Walls create a vapor barrier to protect the finished walls installed in front of it and help to reduce relative humidity, The Iceguard fittings are installed to ensure that the basement doesn’t flood if the discharge line becomes blocked or frozen. 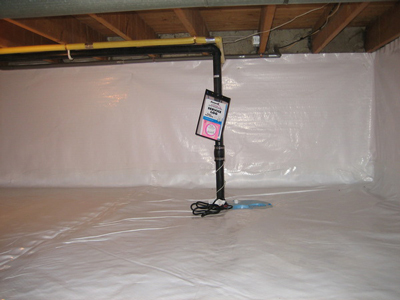 This waterproofing system provides the customer with a dry basement allowing for the refinishing of the basement. They are able to reclaim the living space and have a healthy dry basement for their child. A dry healthy basement translates into a healthy home. A home in Toronto, Ontario had water problems in the entire basement of the house. The home was a 100 year old home with a stone foundation. They had groundwater seepage along the walls and hydrostatic pressure forcing water through areas of the thin and unlevelled, broken floor. The homeowner had to have mold remediation. Future plans were to finish the basement so they wanted it waterproofed to ensure that it stayed dry and mold didn’t reoccur. The customers home office was in that room. He relied heavily on that room for his business, but due to the water he couldn’t have his equipment in there. They called Clarke Basement Systems to fix they water problems so they could get their business work space up and running. Our sales rep; Ron Monk explained to the customer that they would need floor removal and replacement, Waterguard, Triplesafe, Cleanspace walls, Iceguard. Dave Jackson, Jose Martinez and the team were prepared to take on this messy job and turn it into a clean, dry work space. The floor replaced provided a sub-floor drainage bed and an adequate 3 inch level floor slab. Waterguard was installed around the full perimeter of the foundation to collect water and take it to a sump pump ensuring the whole basement stays dry. Cleanspace was put on the walls to reduce relative humidity, ensure wall leaks are drained to the Waterguard and protects the finished walls installed on top of it. The Triplesafe sump system ensures the basement stays dry all the time with the Iceguard protecting the home in the event of frozen or blocked discharge lines. When Tony L. discovered his Toronto, ON crawl space was in disrepair, he knew ignoring the problem would only make it worse. Tony contacted Clarke Basement Systems, and their representative Claude Mathieu went out to diagnose the situation. After examining the property, Claude was able to recommend several crawl space repair products, including the CleanSpace liner and a SaniDry high efficiency dehumidifier. Primary Foreman Jose Martinez and his team arrived on the scene to perform the installation and completed the project quickly and efficiently. Tony was grateful to Clarke Basement Systems for their hard work and courteous service, and he was very pleased with the outcome. I'm purchasing a business in Toronto and would like to level the floor for April 1st. Im looking for a quote for 1650 square feet. Uneven floors in my old townhouse. Tenant reports wetness along wall. We would like a sump pump installed in our home. I have an unvented crawl space in the back of our house under the TV room. I put thick foam slab insulation around perimeter when we moved in but I think more can be done to improve insulation and make the area more usable for storage. TV room is cool compared to the rest of the house. I have a bowing external wall. I would like an estimate on the cost for a repair.